Race Applications - Select an application and click "Go"
The SSG Michael Ollis Run has joined the SI Triple Crown Series. You can now register for all 3 races at a discounted rate. Click here to check out our Staten Island Race Calendar. Races are being added regularly. To add an event to the calendar, email us at sirunning@aol.com. SI Advance Article "We're sad to Announce: Advance's Memorial Day Run will no longer be held"
Matt's Race 5K - 4/22/18 - FInish Line Videos are now posted! The Staten Island Athletic Club will host it's annual Sober Up Run on New Year's Day in Clove Lakes Park. The race is free of charge and starts at 10:00AM. Runners should meet in the parking lot near the Lake Cafe prior to the start time to sign up. Registration for the 41st Annual Celic Run, to be held on 9/2/17, is now open. Click here for the standings after Race #2 of the 3 race series. will host their Twilight Run Series this summer. There will be a 2 mile run every Wednesday at 8:00 PM from June 14th through August 30th. There is no entry fee! Online registration for the Arielle Newman Run is now open. Click here for team scores. Sunday, October 9th, 2016 the NYRR Five-Borough Series will once again finish with the Staten Island Half, a race dedicated to making a positive impact on the borough that hosts the start of the TCS New York City Marathon. Looking for a shorter distance? Join us for the NYRR Staten Island 5K! ItÃ¢â‚¬â„¢s open now for registration and it finishes at home plate in Richmond County Bank Ballpark. Visit NYRR.org for information. Results will be posted live throughout the race! NO ENTRY FEE - In lieu of an entry fee, we ask for donations of boxes or cans of non perishable food. COME Ã‚Â½ Hour before your race and Run! for the 5K Clove Lakes course on thursday Sept 24. Click here to read the article by Jeff Benjamin on silive.com. Click here for the article on silive .com about the race. Arielle Newman Run - 7/4/15 - Entry is now open! on Two-Time NYC Marathon champ Tom Fleming's New Book "The New Rules of Running"... click here to read the book review. Tom Fleming is also joining us here on Staten Island on Wed Night, July 9th at the SI Hilton for a book signing and free autographs!! Arielle Newman Run Registration will be available shorty. Please check back soon! at Moore Catholic High School, Staten Island. Click here for more information and to purchase tickets. If your would like to place an as in the 2014 Triple Crown Commemorative Journal, click here for more information. 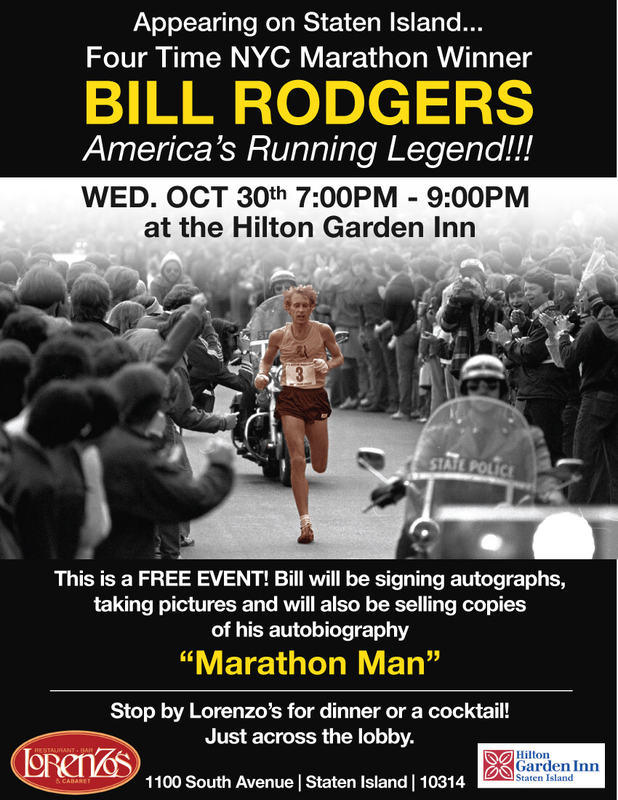 Running Legend Bill Rodgers is coming to Staten Island! !-Wed Eve October 30th!! Bill will be signing autographs and taking pictures for everyone! will be held on May 16, 2012 at Moore Catholic High School. The 2011 Triple Crown Winners will be honored. to any senior attending high school who is either a resident of Staten Island or enrolled in a Staten Island High School, and is a member in good standing on their high school cross country or track and field team. Videos of the varsity events, provided by trackshow.com, are now available. Click here for results and videos. Click here for results and pictures. Click here for results from silive.com. You can now view pictures of this race! Pictures have now been posted! Click here to visit the statenislandtrac.org website. Corrected results have been posted and we have added a link to pictures for this race! honors FF Nicholas Rossomando/Rescue 5, S.I. who gave his life while saving others on 9/11/01. Nick's Fund has been associated with the ING NYC Marathon as a Charity Partner since 2006. We have thirty (30) guaranteed entries to offer out for the November 7, 2010 race. Interested in procuring one of these entries? Please visit our website homepage at www.Nicks911collegefund.org, click on Register to Run . We are recruiting runners for Nick's Team NOW! The athletes chosen below are my personal choices. I based the rankings on performance at the highest level- therefore, open and collegiate championships do more for oneÃƒÂ¢Ã¢â€šÂ¬Ã¢â€žÂ¢s resume than does a high school championship. Click here to read the full article. Click here for results and the video. As you may have read in Staten Island Advance, the Greater New York Council's, Boy Scouts of America are seeking a nearly $30 million conservation easement from the government for their 120.7 acre Pouch Camp property, or they may be forced to sell it to developers.If you are interested in the preservation of Pouch Camp, please visit this web site for information. Pictures are now available for this race - click here. The final standings of the trail triple crown will be posted by the middle of next week. Click here for the 2 race triple crown standings. The Celic Run Fundraiser will be held on Thursday,9/3/09 @ Nurnberger Bierhaus. their 2nd Annual Event and Fundraiser - "Ground Breaking". Thursday, March 26, 2009 - 7:30 PM. We are updating our 2009 calendar. Please email your spring and summer race dates to sirunning@aol.com. If you are interested in sponsoring the sirunning.com website, while helping to promote your race, please let us know. Sponsorship includes a large banner at the top of the home page with a link to your race application or website. Thanks for your support! Click here for a full list of Staten Island finishers. train for a half or full marathon - walk or run! To support the fight against Cystic Fibrosis - October 30, 2008 - 7 to 11 PM at The Beer Garden. Every Saturday at 9:00 AM - 1/2 mile - Click here for more information. Caitlin Tormey 24, formerly of Notre Dame H.S. recorded the fastest women's time in Staten Island history in finishing 23rd place in the 2008 US Olympic Marathon Trials (Sun. April 20th.) in Boston. Her time was a Staten Island record of 2:40.29 (6:08 pace). Congratulations to Caitlin! SITRAC will be honoring her at a reception on Thurs. May 1st at 6PM at the Greenbelt Recreation Center on Brielle Ave. Everyone is welcome! Click here for more information about the reception. above on this website has been postponed due to an illness. The show will be rescheduled shortly and the new date will be posted on this site. a High School senior who is a member of their school cross country or track & field team. in conjunction with the SIAC Saturday Fun Run at the Clover Lakes Park. After the run, the Dunkin' Donuts on 770 Forest Ave will be providing free coffee and food for all participants, along with t-shirts and photo opportunities with our Giant Coffee Costume that one of our marathon team members will be wearing the entire course of the NYC marathon. Luke's Great Escape Raffle - Win a Caribbean Vacation - Drawing on 6/20/07. will be held on January 21, 2007 at the 168th Street Armory. To view the top 100 Male and top 50 Female times at Van Cortlandt Park for Staten Island High School runners, click here. If you would like to submit an article on any subject relevant to running,health, diet, exercise or high school/college running, we want you! All are welcome! E-mail your article to sirunning@aol.com. Below is a list of those in the Staten Island Running community that have been lost in the attack on the World Trade Center od September 11, 2001. A Tribute to Tom Celic - By Dave Panza. Click here. A Tribute to Steve Lauria - By Dave Panza. Click here. Keeping Things Running - By Glenn Ribotsky. Click here. My Teamates - My Brothers - By Alma R. Ramos. Click here. The September 15th Fun Run - By Richard Ruberto. Click here. If you belong to a running club and would like your clubs results posted on this site, just send an e-mail to sirunning@aol.com. If you know of any races that are not posted on this site, or if you would like your race application or race results added to our site, please let us know. As always, we welcome any input or ideas that can be used to make this page a better resource for runners, and more informative. Our email address is sirunning@aol.com , just click here to send a note. Welcome to The Staten Island Runner. This web page was created to provide information, in a central location, to those of us that live in Staten Island and enjoy running, at any level. The index on the left and right provides information on upcoming races in the Staten Island area, a book store, links to sights of interest to runners and race results for races held on Staten Island. We have also included printable race applications for Staten Island Races.